Fall Creek Falls State Resort Park's cabins could be in line for a face-lift. Parks officials are surveying guests who stay at the resort park's inn, cabins and campsites about ideas for updates and improvements. Photo by Ben Benton /Times Free Press. Fall Creek Falls State Park, designed and constructed in the 1970s, is the focus of a $1.4 million project to renovate its popular fisherman cabins. 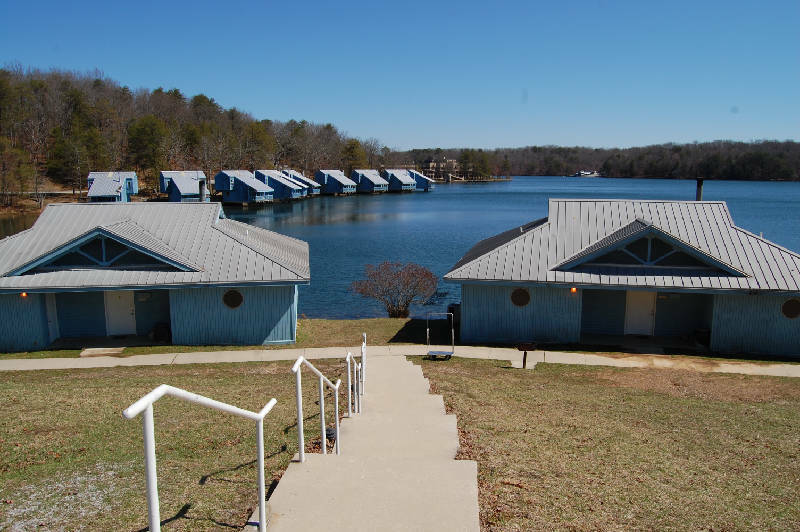 The 10 cabins that sit along part of 345-acre Fall Creek Falls Lake, with covered fishing porches jutting out over the water, are in line for new furnishings and updates inside and out, said Brock Hill, deputy commissioner of the state Department of Environment and Conservation. "Those cabins are the most popular of any state park we operate," Hill said Friday. "They have high occupancy rates, and we need to get them fixed up and maintain them more." The work will be the first of a number of renovation projects that came out of a survey this spring, Hill said. The park's other facilities include the 145-room Park Inn and the Village Green, which has a pool, shops, picnic shelters, snack bar and restrooms. Architects use input from the survey in designing the individual projects. The fisherman cabins were not part of the survey, Hill said. Those renovations were funded a few years ago. "Those cabins were built with the original park -- they're fairly old. There have been some odds-and-ends renovations done through the years but nothing as comprehensive as what we're going through now," he said. The interiors will be completely renovated, refurnished and all the heating and cooling systems converted to geothermal, he said. David Benton, director of capital projects for TDEC, said the work should be bid in September. It is expected to begin in December and be complete by Memorial Day weekend 2014. Benton said the cabins' energy-efficient geothermal systems are projected to pay for themselves in 13 to 15 years. Geothermal systems also are planned for the inn and the land-side cabins. Hill said park activities are undergoing some modernization, too. "Adventure-type sports" are more popular nowadays, so officials are studying ideas for new activities. The park recently reached an agreement for a privately operated zip line at the Village Green, Hill said. Contact staff writer Ben Benton at bbenton@timesfreepress.com or 423-757-6569.